See the Big Picture connections between goals, decisions, status, issues and directions. Consultants face a constant challenge when working with customers: How to get the appropriate amount of detailed information in order to provide viable and sustainable solutions. There is no doubt that behavioral modifications and process efficiency strategies can bring rewards to a business. But do these truly answer the real problems? Will they secure the desired, sustainable changes? Are they acceptable to everyone? What compromises are required? These are just a few questions that arise. In the hands of the consultant, the FoRSE® Matrix system serves as a powerful tool to figure out the right course of action in the decision-making process, and determine the real problems and their effects. Request a free trial and see for yourself how the FoRSE® Matrix system’s penetrating questions could put you ahead of the competition. And our secure database helps you collect and maintain your data. 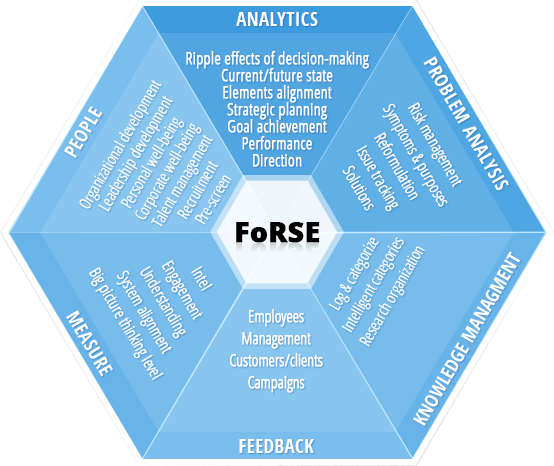 Enhance your consulting power with The FoRSE® Matrix now and enjoy big-picture thinking at your fingertips. Whether you’re a sole proprietor or a multi-department, multi-national organization, running your business involves making decisions. To reach your goals, you will want to know details about steps to take, directions to follow, improvements, effectiveness, status, and so on at various times. In this way, each decision you make will have profound consequences on your business. That’s why you need to be able to understand the impact of each decision from many angles. Already a Salesforce customer? See the FoRSE® there soon! Medium and large-scale organizations and businesses can benefit from using the FoRSE® Matrix system in-house. Use it as a guide to help in your decision-making and analyses of events, perform diagnostics, or consider a big(ger) picture regarding future possibilities, and so on. Using the FoRSE® Matrix in-house will save money over hiring a consultant in many cases. We’ll teach you how. While some issues might be fairly simple, many others will be complex and demand a robust, informed response. That leads to the question: Do you hire a consultant or share your ideas with someone else or a team? This is where Ripple Deep comes in. We employ the FoRSE® Matrix System for you so you can see issues from a big-picture, or systems, perspective, providing a clear view of the ripple effects that any given path can have on your organization or business. Give us a call to book an appointment now. Enhance your consulting power with The FoRSE® Matrix now and enjoy systems thinking at your fingertips.